Kitchen veggie garden I designed. 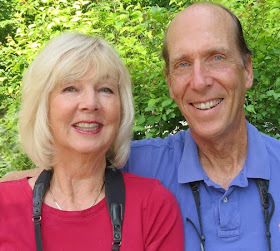 In addition to being hooked on birds, and having an over 30 yr. career producing bird field guides, birding TV, and more, we also garden, avidly. 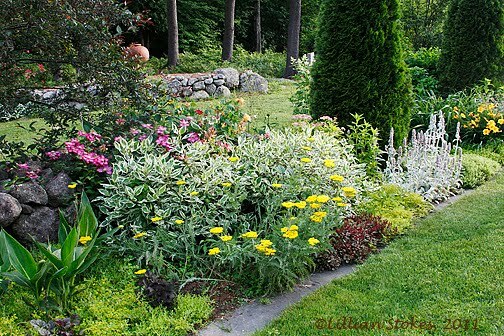 Our gardens are carefully created for beauty, good design (I choose all the plant combinations), colorful plant material through the seasons, and to be bird-friendly with plants that attract our avian friends. We have gardened in several states (MA, FL and now, NH) and have had our gardens on various garden tours, including The Garden Conservancy tour. 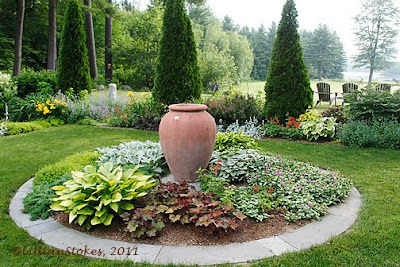 A few days ago, Francis H. Cabot, visionary gardener and inspirational founder of The Garden Conservancy, passed away, leaving a legacy of a great organization that does much to preserve America's exceptional gardens and promote gardening in America. You can visit amazing private gardens all over America, in spring, through joining their Open Days program. 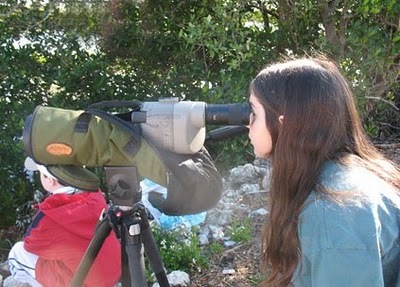 We always try to let kids look through our scope at birds. We just got a nice letter from Jerry Medina, a teacher in Tucson, AZ who is encouraging his first grade class to become interested in birding and blogged about one of his budding birder students. That's so cool. We love to encourage kids to get involved in birding activities. 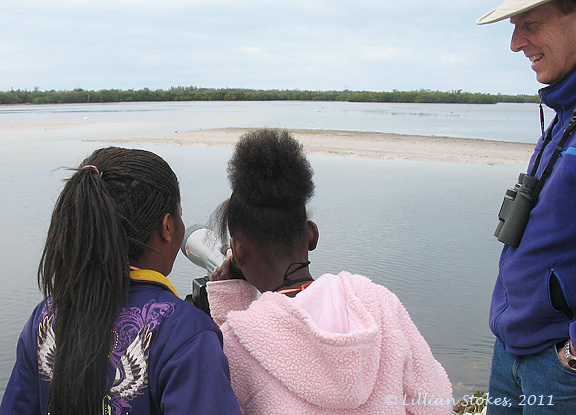 Kids who are interested and informed about birds become the conservation leaders of tomorrow. 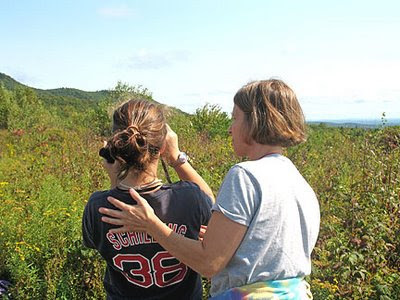 Here are a few tips and resources about birding for kids (click on the red links for more information.) 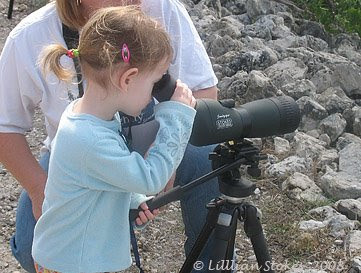 Even small children can be introduced to birding. Make sure and lower spotting scopes to the proper height for kids so they can see the birds. full-sized binoculars for older kids. 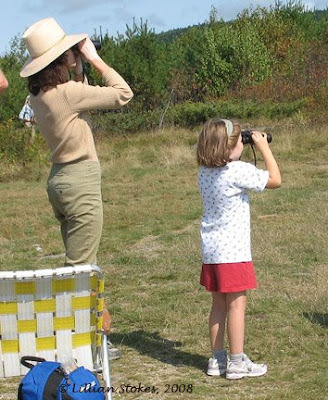 The Young Birders part of the American Birding Association website is an excellent resource for kids age 10-18. 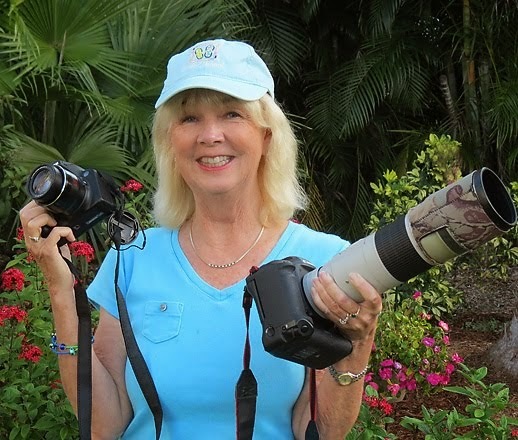 They have a Young Birder of the Year Contest with prizes in categories for keeping a field notebook, bird illustration, bird writing and bird photography. 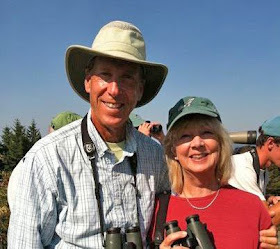 They also have kid's birding camps and kid's scholarships to those camps and other birding activities. A Bird's-Eye View bimonthly newsletter is edited and written by young birders. Most importantly, you can help spark an interest by taking a kid birding, whether it's your own kid, a grandchild, neice, nephew or just a friend. Here's a link to the Young Birder's part of the American Birding Association website. 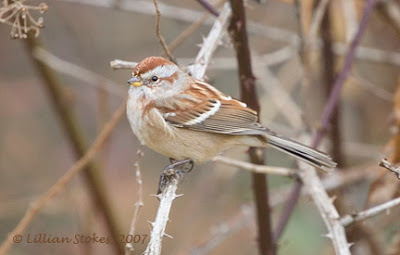 One of the highlights at our bird feeders now are the newly arrived American Tree Sparrows. Like the juncos, they spend the winter with us and depart in spring. 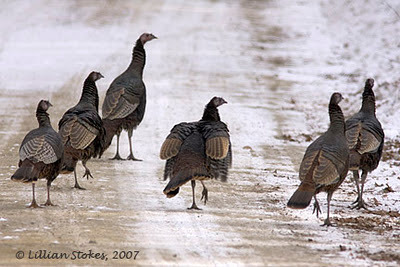 We enjoy their delicate good looks and their tinkling calls, as they roam the winter landscape. 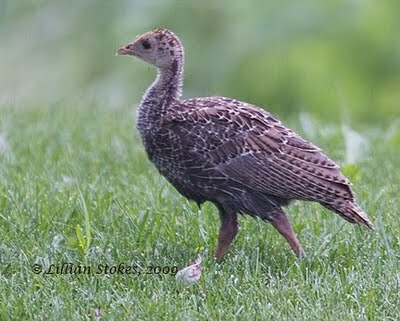 They breed across upper Canada and in Alaska and are seen in winter throughout much of the country. Their central breast dot stands out on their clear breast and notice their white wing bars and yellow lower mandible, good ID clues. American Tree Sparrows eat weed seeds and come to our feeders for millet, cracked corn and other small seeds under the feeders. We often go out in our yard with our binoculars and look at the feeders and around our property at any sparrows we see, looking closely at these subtly colored birds. 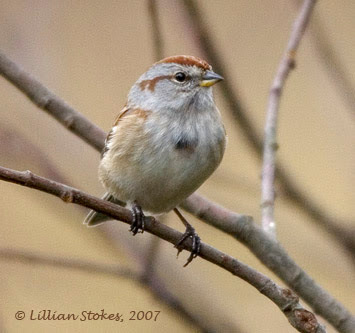 The reward is discovering and identifying the many species of sparrows in fall and winter. 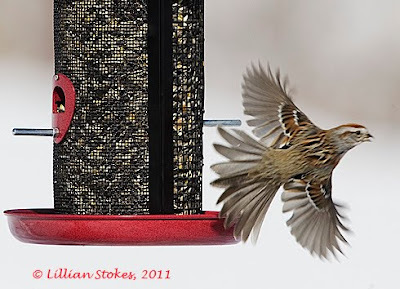 Try it, you may be surprised at how many species of sparrows can see at your own feeders. 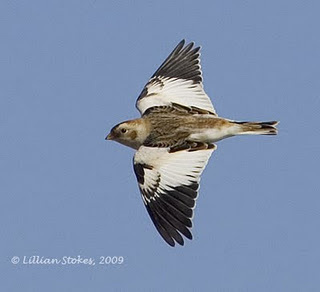 Are you seeing Tree Sparrows and if so, where are you? 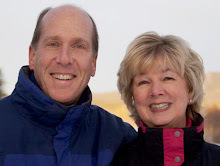 Happy Thanksgiving from Lillian and Don! Give thanks and be grateful for all the birds! Here are some turkey photos of a flock, with one flying out. They have the right idea, head for the hills and hide out until after Thanksgiving! Turkey photo of the day plus funny bonus photo! Yup, Gryff - I think those are Turkeys outside!" 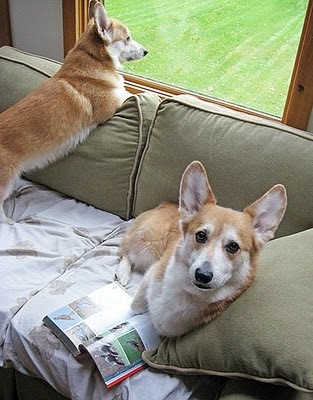 and when our field guide came out, we were sent this funny photo of 2 Vermont Corgis, Gryf and Rugby, who are ID-ing turkeys with their Stokes Field Guide. 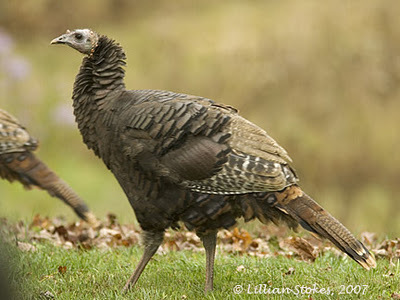 Since this is the week everyone is obsessed with turkeys, I thought I would post a different photo each day of a Wild Turkey. 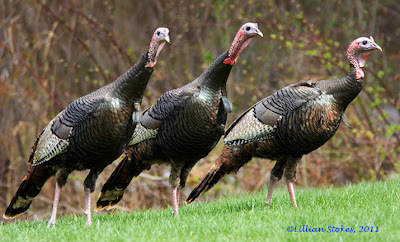 We are lucky to have Wild Turkeys visit our property throughout the year, here in NH, and we get to enjoy seeing them at all different stages of their life cycle, from males displaying in spring, to hens with young (called poults) in summer, to winter flocks consisting of hens and young turkeys of both sexes. Males form their own winter flock. 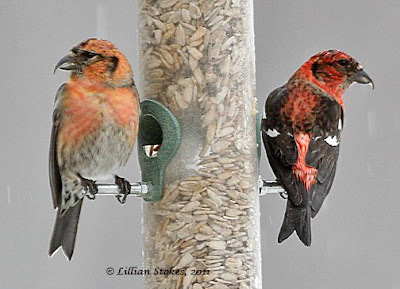 Winter Feeder birds, bet you didn't know these things about them! 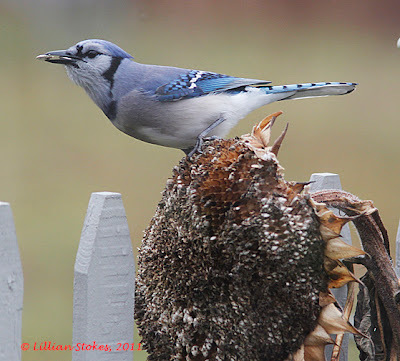 What birds can you expect at your bird feeders in winter? Quite a few, if you keep your feeders well supplied with quality bird seeds and suet. A great number of birds that breed in the U.S., such as vireos, orioles, flycatchers, hummingbirds, warblers, thrushes, and swallows, etc. migrate south for the winter. 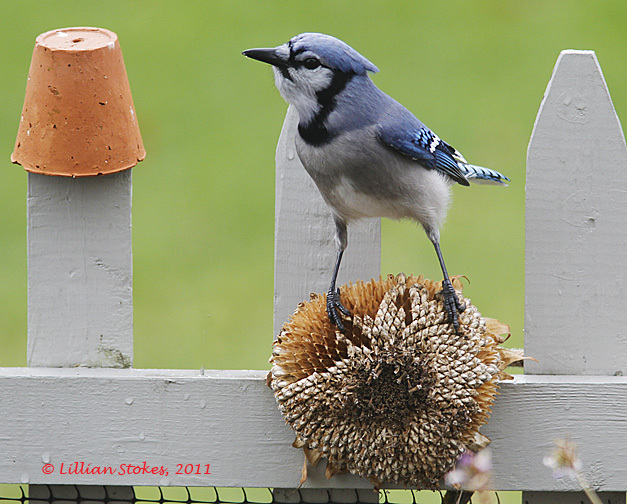 However, many birds live in the same area all year round, and other birds will come to your feeders just in winter. Here are some feeder birds that you might expect. 1. Black-capped Chickadees breed as pairs on their own territory. 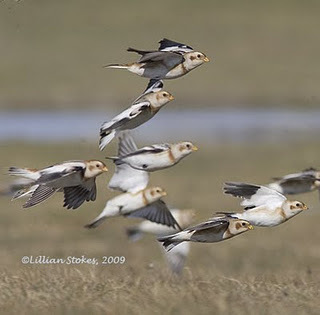 Come fall, they join up into flocks of about 6-10 birds or more, consisting of mated pairs and non-breeders, but not the offspring of the adult pairs. The flock remains on a winter territory of about 20 acres which they will defend from other chickadee flocks. If your feeding station is in their territory, they will visit every day. 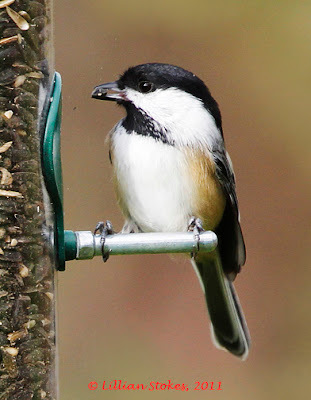 The flock has a pecking order and you can see the most dominant chickadees supplant the less dominant individuals at your feeder. Other species of birds, such as woodpeckers, titmice and kinglets, may temporarily join chickadee flocks as they move about the woods. 2. 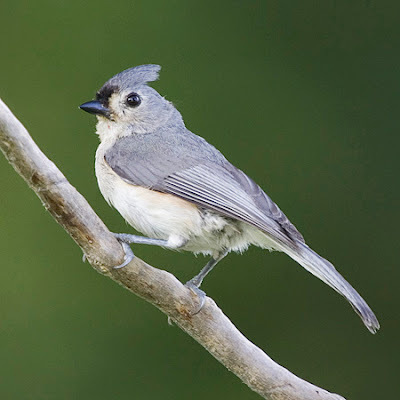 Tufted Titmice stay in family groups in the winter. The flocks move in a fixed range of about 15-20 acres. Titmice are conspicuous and vocal at feeders. 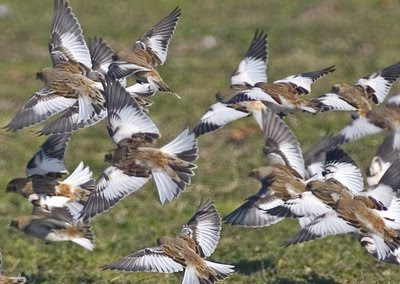 Come spring, the flocks break up into breeding pairs and lone birds. 3. White-breasted Nuthatches are common feeder birds in much of the country. They stay as a pair throughout the year in a fairly fixed range of about 25-45 acres, but during breeding they claim a smaller portion of this range for a breeding territory. In winter, the ranges of nuthatches may overlap, so you may see more than one pair at your feeders. Nuthatches can climb, headfirst, down trees. 4. 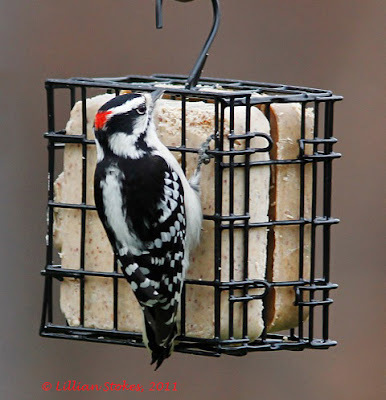 Downy Woodpeckers and their larger, look-alike relative, Hairy Woodpeckers, are found at feeders all across the country. They live as pairs through the year on a range of from 5-25 acres for the Downy, and from 6-8 acres for the Hairy. 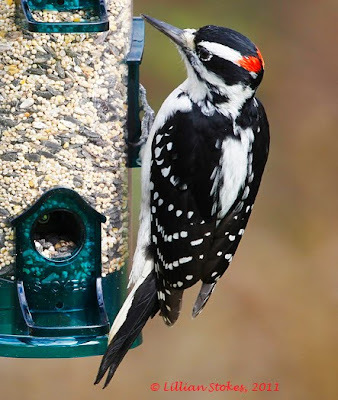 The ranges of neighboring woodpeckers may overlap, so you may see several pairs at your feeders, especially if you offer them suet. Woodpeckers don't sing, but communicate through drumming on resonant surfaces, like a tree trunk. 5. 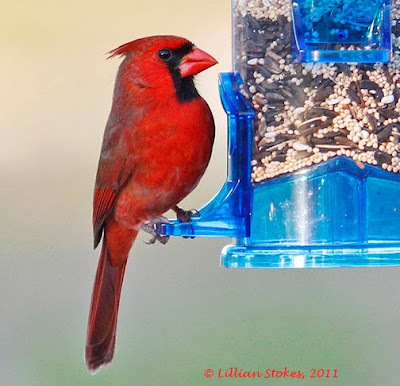 Northern Cardinals live on a territory of about 3-10 acres. Some live there throughout the year. Other cardinals form into flocks in winter and go where there is plentiful food. In spring, they return to their breeding territories. Both male and female cardinals sing. 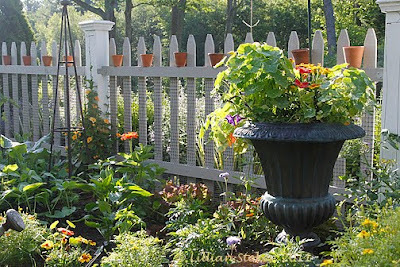 Listen for them in spring. 6. American Goldfinches are beautiful feeder favorites. 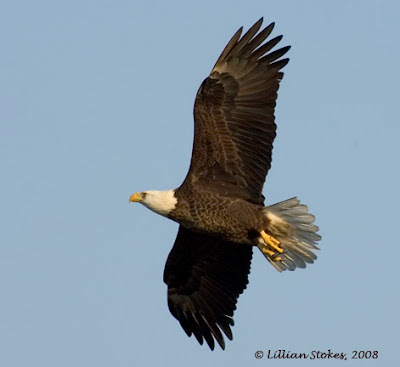 They're bright yellow in spring and molt into a more subtle brownish-gray plumage in winter. During breeding, they live on a territory of 1/4 to1 acre or more, which they defend from other goldfinches. Once breeding is over, they form into flocks and may show up in late summer at your feeders in large numbers with their fledged young. In fall and winter, goldfinches vary in their degree of seasonal movement. Some remain in an area and others may wander widely in flocks, prompting people to wonder where the goldfinches have gone. Keep feeders stocked with sunflower and thistle to increase your chances of them visiting you in winter. 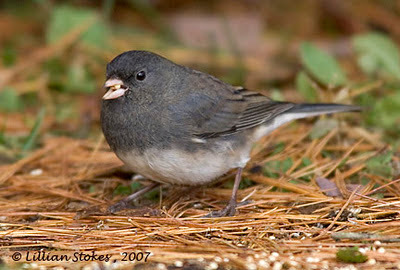 Dark-eyed Junco look somewhat different in different areas of the country because there are subspecies. 7. Dark-eyed Juncos, a kind of sparrow, are nicknamed "snow birds" because they're a species who arrive at feeders, often when the snow flies, and also because their plumage of dark gray above and white belly, looks like "gray skies above and snow below." They breed in more northern and in mountainous areas of the U.S., and in Canada, but move more south and throughout the U.S. in winter. Juncos tend to winter at the same spot each year and stay in fixed flocks with a stable dominance hierarchy. The flock forages in a defined area of about 10-12 acres, but not all of the flock members always move about together, so you may see varying numbers of juncos. 8. Mourning Doves live throughout most of the country all year. 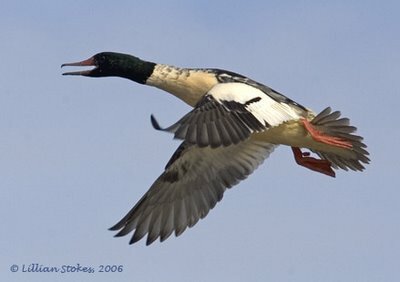 In winter, they join into flocks which can be up to 50 birds or more and feed and roost together. These flocks wander about an area as food resources change. Flocks in the northern states seem to have a higher percentage of males. 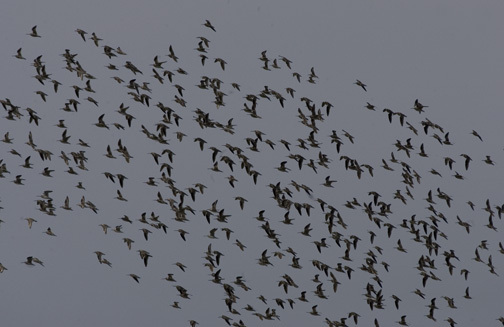 The flocks may stay stable in membership through the winter. 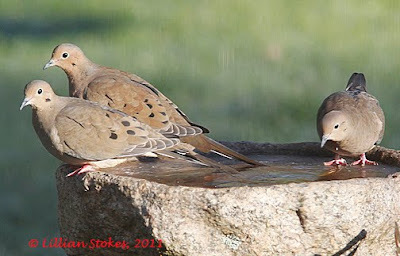 In spring, Mourning Doves will pair up and breed, defending only a small area around their nest, and will leave their nesting area to feed in a flock. Since Mourning Doves like to feed on the ground or from tray feeders, keep feeders and the ground below them shoveled of snow. 9. "Irruptive species" of winter feeder birds include, Pine Siskins, Common Redpolls, Pine Grosbeaks, Crossbills and Evening Grosbeaks. These birds mainly breed in far northern areas and wander down into the U.S. in winter to feeders, when the food supply on their breeding areas is scarce. Thus, they appear some years in numbers and less so in other years. Tree Sparrow in flight, leaving our feeder. Love it! Western Kingbirds being seen in New England, be on the lookout! Note the white edge to the tail. 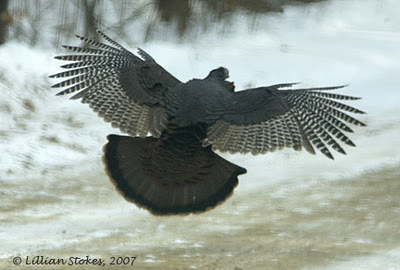 In flight shows the white edges to the outermost tail feathers and dark tail contrasts with paler back. 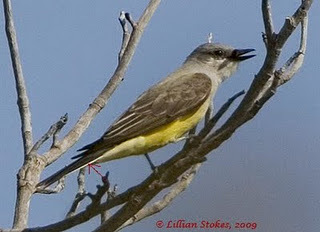 There have been several reports recently of Western Kingbirds showing up in New England. One was reported in Westport, CT, and another in New Salem, MA. 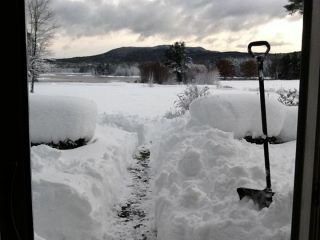 Another showed up mid-November in 2009 in Rochester, NH. These are all rare sightings and can cause much excitement for birders. Be on the lookout. The Western Kingbird is a type of flycatcher whose range is in the West, but it's a common vagrant (bird who wandered out of range) to the East. 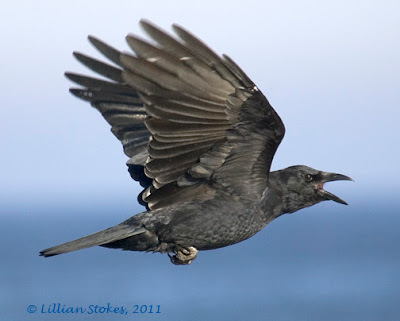 They have a yellow belly, gray head and breast, and a dark tail that contrasts with the gray back. The tail has white edges. 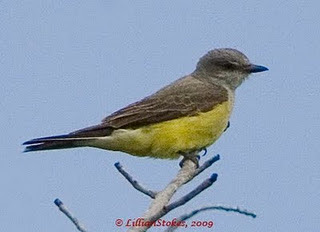 We were lucky to have seen a Western Kingbird on our southern NH property on August 31, 2003 when our friends from FL, Lois and Leon White, were visiting. It was seen well by all of us. Always nice to produce a rare species for your area when birding friends are visiting. 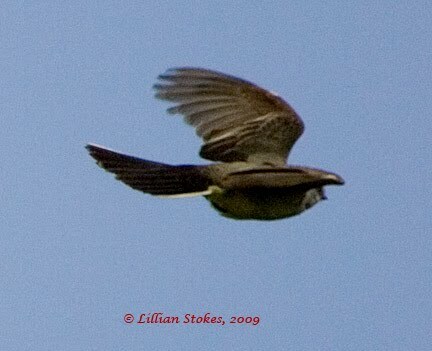 Above photographs are of a Western Kingbird I photographed in Sanibel, Florida in Jan. 05. Blue Jays are quite beautiful, actually, and if we saw the in another country, away from our prejudices, we would be oooh-in and aaah-ing. 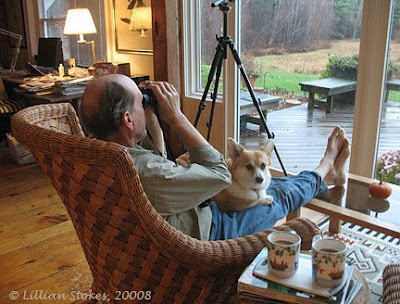 Armchair birding is part of a birding life. Recently we decided to rearrange some of our furniture and plunk ourselves in front of our big window so we could do more birding in the morning while having coffee. 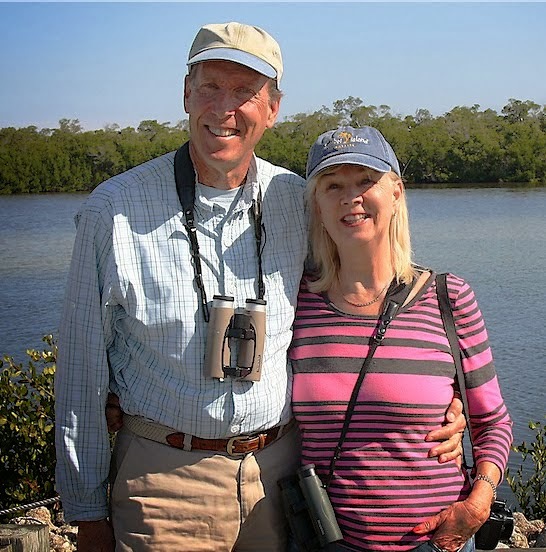 We keep binoculars, spotting scope, field guides and our bird journal handy. We love it! It enables us to do birding before going to work, or when the weather is terrible and we can't go out. It's amazing what you can see if you just keep your binos handy and look out your window at your bird feeders and beyond, even if you do it briefly in the morning while you are making your coffee. Another part of armchair birding is looking at the internet and living vicariously through all the blog entries, facebook and twitter photos that your friends are posting. However, it does not substitute for the real thing of looking through your binos at real birds. 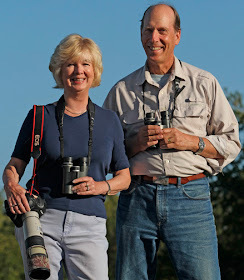 Armchair birding is now part of our birding life, maybe it can be part of yours too. Pine Siskins have arrived in NH! Pine Siskins are small, brown-striped finches with yellow on their wings. We just saw a few Pine Siskins in our yard. Remember last year's winter finch invasion? 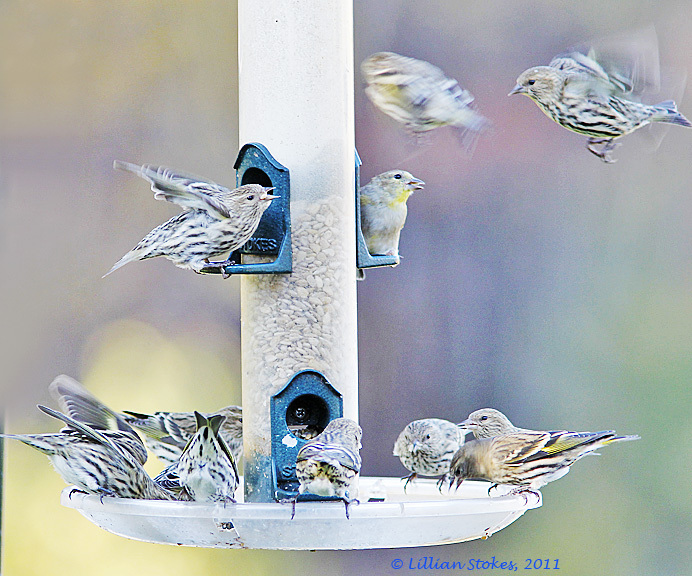 Pine Siskins were numerous by the end of October last year. The above photo was taken on 10/22/10. 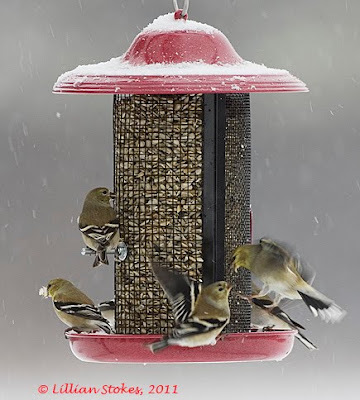 Will this be another big year for winter finches? The answer is no, according to Ron Pittaway, of the Ontario Field Ornithologists, who does the Winter Finch Forecast each year. There are plenty of cones and seeds across the boreal forest and the Northeast and no big need for many of the irruptive finch species to leave their northern areas. However, Pine Siskins had a good breeding year in the Yukon and those birds may wander widely down into the U.S. in search of food, as the spruce seed crop is just average where they bred. 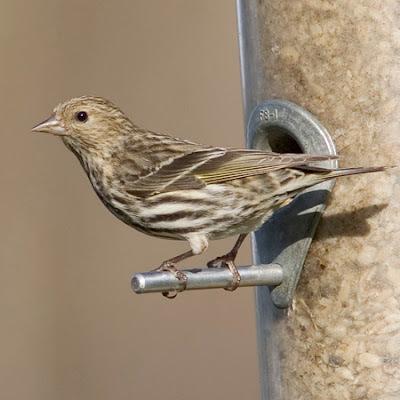 So be on the look-out for Pine Siskins and other winter finches and let us know what you see. What with the "murmuration" (i.e. group) of starlings making the rounds, (there's a video of a very large flock of starlings going to roost) I thought I would post some of the collective noun names for groups of birds. Who thinks up these things? For the complete list of collective noun names for birds go here. 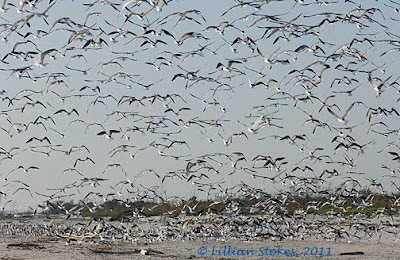 More importantly, it is always fascinating to see large flocks of birds and scientists are still studying how birds can react so quickly in large flocks and not collide. There is no leader of the flock. Birds have lightening fast reflexes that allow them to fly and swerve together. Often the large flock is a predator avoidance technique, where birds are staying together, most trying to be in the middle of the flock as a safer place when the Peregrine Falcon is hunting the flock. Sometimes birds flock for migration, or going to roost. We have seen large flocks of thousands of shorebirds at Ding Darling National Wildlife Refuge, Sanibel Island, FL, swerving away from falcons. 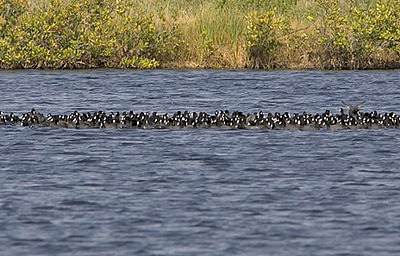 The tight flock of American Coots in the photo above, taken at Merritt Island National Wildlife Refuge, FL, are huddled because a Bald Eagle was hunting them. 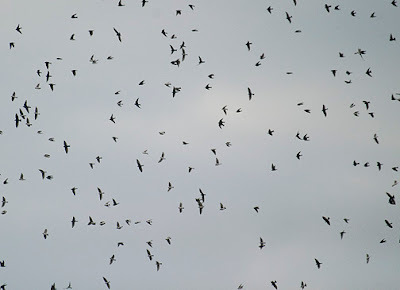 Tree Swallows migrate in flocks that can number in the thousands. 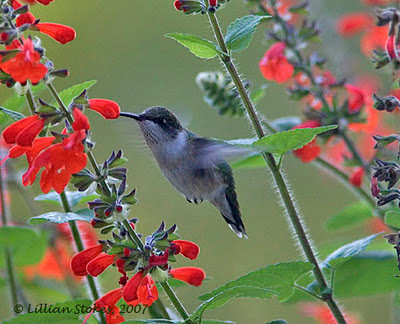 You can see them in coastal regions and in FL in winter. Crows, in winter, form huge winter roosts, sometimes of many thousands. At dusk, you can see rivers of crows, all flying to a meeting place where they will roost in trees together. At dawn they return to their territories. This time of year, along highways and near bridges, you can see large flocks of European Starlings, who roost together at night. Look around you, become aware. Birds are doing fascinating flock behaviors right near you. The snow here is finally melting, but we still have big piles in our driveway and 4-6 inches in the woods. Here's a photo of an American Robin, taken after the storm. Fortunately, robins eat berries, so our crabapples provided food. We have had robins every day since the storm. American Robins wander widely in flocks in winter. It is not unusual to see a few here in NH in December, prompting people to think the robins forgot to migrate. When more severe weather sets in and the crabapples and other berries get eaten, robins will move south. 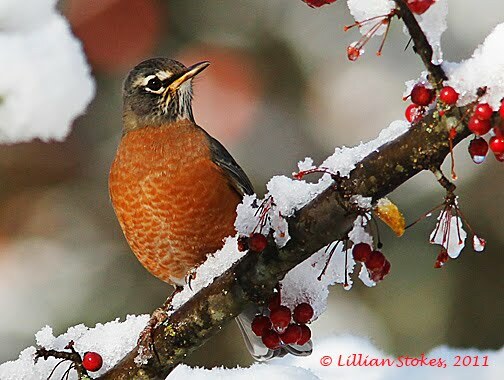 You can see huge flocks of robins in winter in Florida, eating the plentiful berries there. We have seen them devour the small fruits of palm trees. 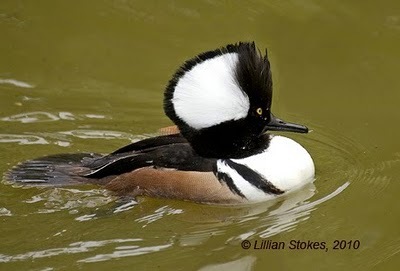 We also are seeing waterfowl migration taking place here, including 20 Hooded Mergansers this morning and several Common Mergansers. Have a good weekend, go see some birds. 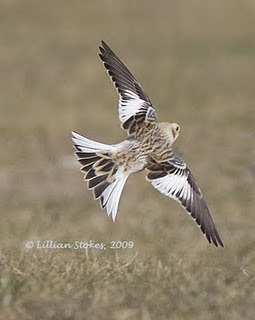 Just on cue, we saw a Snow Bunting this morning. How appropriate, seeing as we got 21 inches of snow here on Sat. and Sun., a record, for this early, for NH and New England. Snow Buntings are beautiful little birds that breed in Alaska and the Artic and winter in lower Canada and across much of the U.S. They stay in large flocks in winter, feeding on the ground on weed seeds. This morning we saw the bunting fly over our heads, up high. We listened carefully to its calls and confirmed the identification that way. 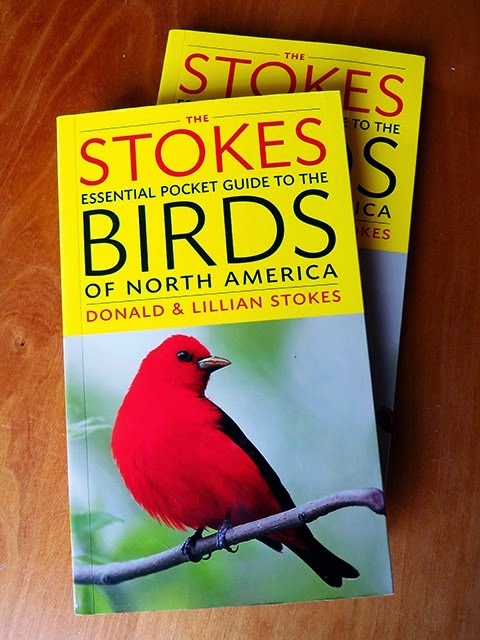 You can become a much better birder if you know the songs and calls of birds. 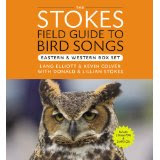 Stokes Field Guide to Bird Songs CDs east and west boxed set. 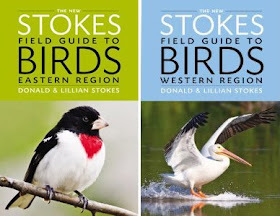 Try our Stokes Field Guide to Bird Songs CDs, (recordings by Lang Elliott and Kevin Colver) comes as eastern region, western region, or east and west combined in a boxed set. These are widely recognized as the best CDs to North American bird sounds.